Now for Crafting 101 from Diana Wildheart! and how to start it. Or even how to do it! For beginners, crafting can be a very confusing issue. But that's why we created this guide! So you can have a smooth sailing through the wild confusing world of Crafting. 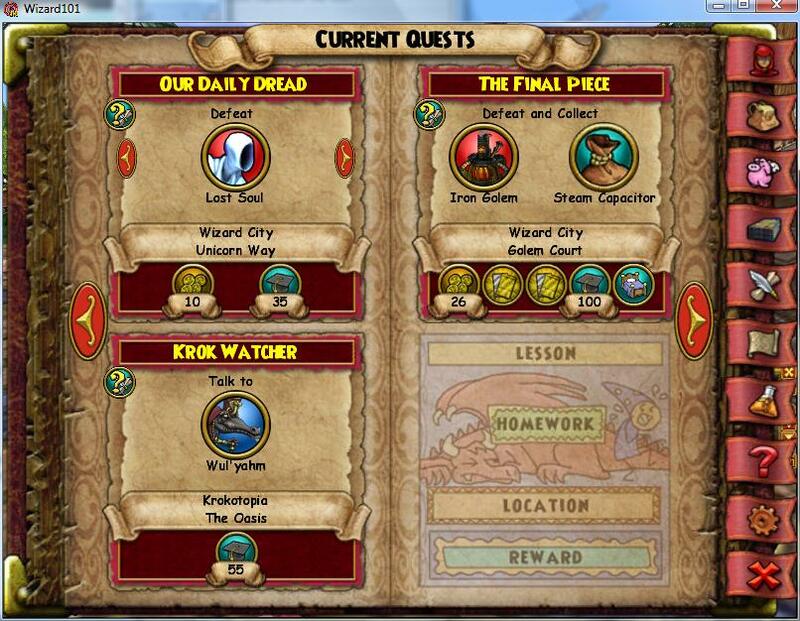 To get to your first Crafting Quest, check your Map. If you are in the Commons, go through Shopping District and keep going to Olde Town. When you get in Olde Town, go down and go left. 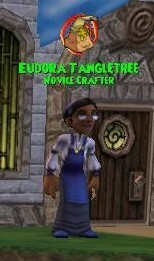 You will see a lady named Eudora Tangletree, Novice Crafter, on your left by a small building and a small water stream. Talk to her and she will explain what you need to do. 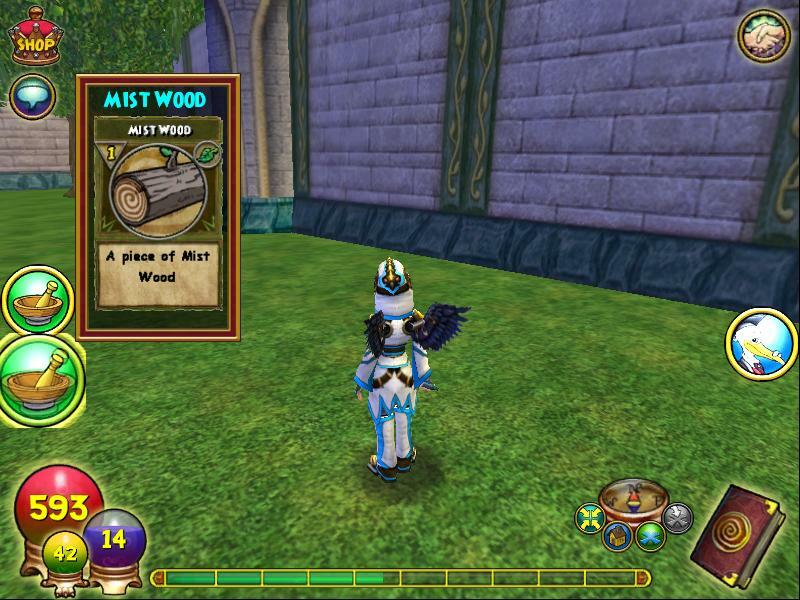 Mist Wood is a Reagent that you need to craft things with. 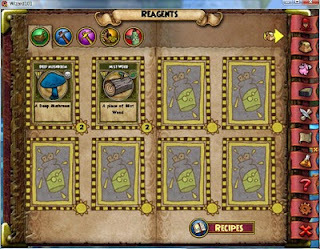 Reagents are ingredients that you will need to make a bigger and better new item. 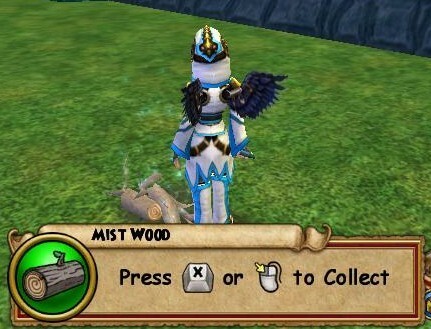 Where do I find Mist Wood? 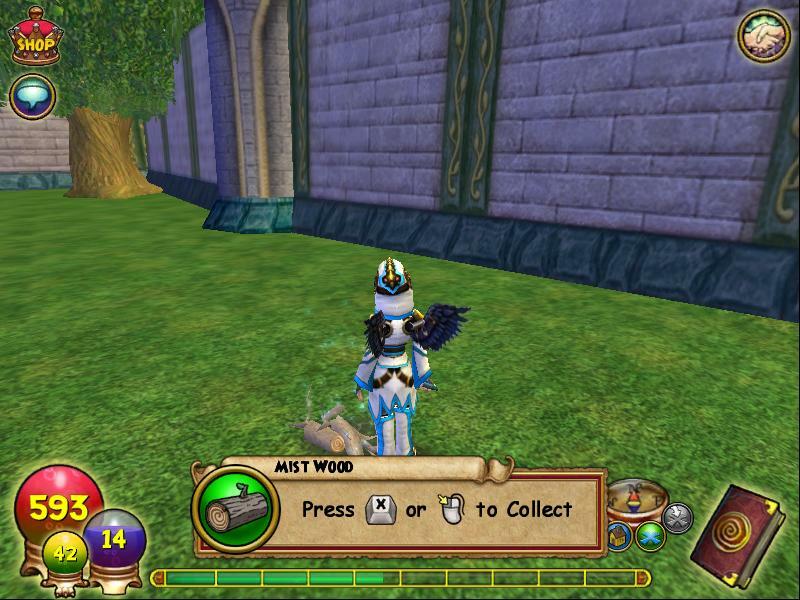 As you see in the pictures below, most of them can be found on the ground near trees in Wizard City. 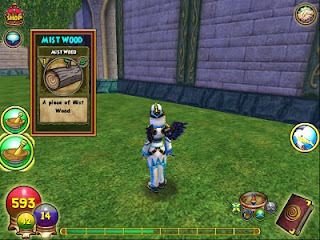 But, you also can go to the "Bazaar" which is a store in Olde Town and buy some Mist Wood there. 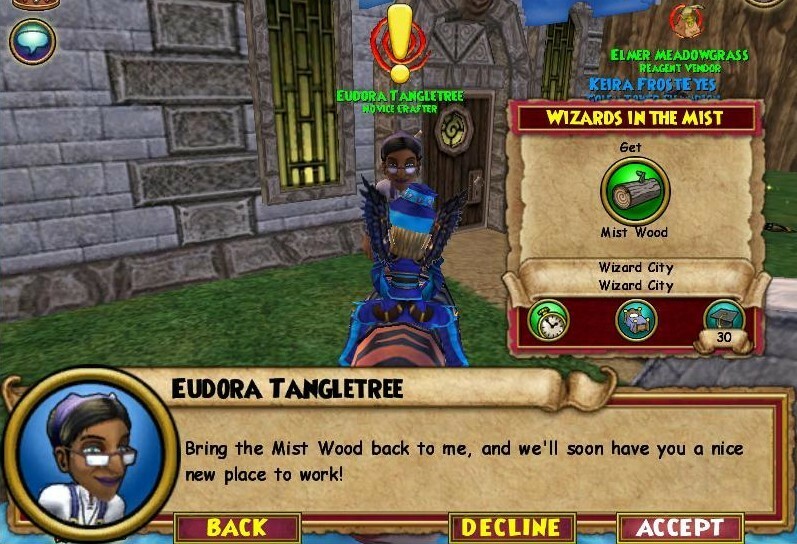 Now, you have to bring the mist wood to Eudora Tangletree. 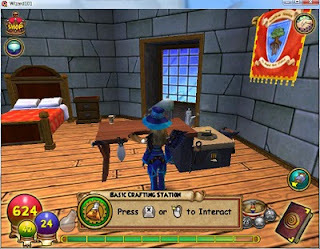 Now, you got the Basic Crafting Table which is going to be very useful for you when you want to craft things. 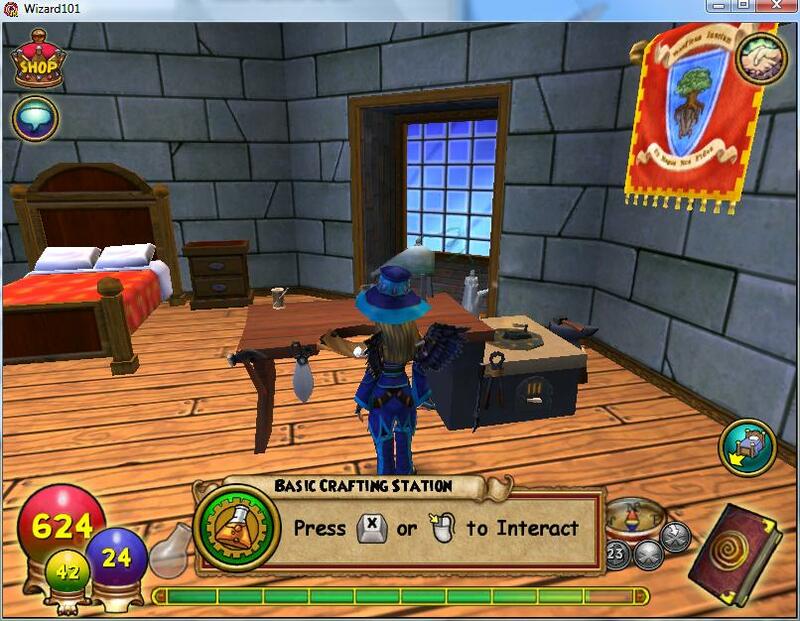 You can go back to dorm or house to set the crafting table for your next crafting quest. But wait, don't go to your dorm or house just yet. Now on to your FIRST Crafting Quest! You can always Decline, but it's best to Accept since in the future. for fighting against the monsters in the Spiral. You see, there are amazing items that you only can craft as, for example, Grandmaster Artisan. that you will need for survival. Or if you want to craft amazing houses, you need to be Master Artisan to craft those. 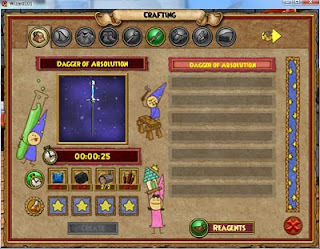 Click on "Dagger of Absolution" which is what you need to craft for your quest. Click on it and click on "Buy." 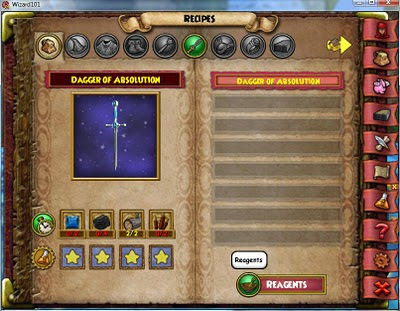 Since you bought the Recipe for Dagger of Absolution, so it's in your quest book now. Where do I go to see what Recipes I have? See Book in Right bottom Corner? Click on it or press Esc. Then the book will open. This is what you will see once your book is open. without going through any steps. Notice the "Reagents" button at the bottom of this book. Click on it. Also it's useful to write down the Recipe in a chart like this. So it doesn't get confusing to figure out exactly what you need. 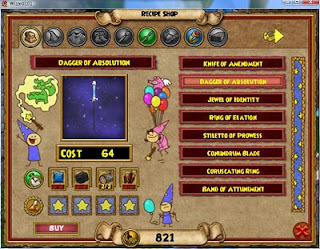 For now, I have made a chart for the Dagger of Absolution so you can see what you need. They are the people who are usually standing next to the Crafter person. They sell certain things you need for your Recipes. 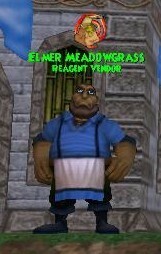 Click on Elmer Meadowgrass who is standing next to Eudora Tangletree. 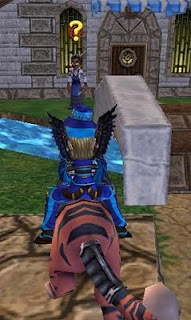 Buy Sapphire and Black Coal from him for your first crafting quest; Dagger of Absolution. He won't have EVERYTHING you need. So either "farm" for what you need that would be laying around such as "Mist Wood"
which has a LOT of reagents for sale that you could buy. Not all are easy to get. And some are expensive. and how much patience you have. 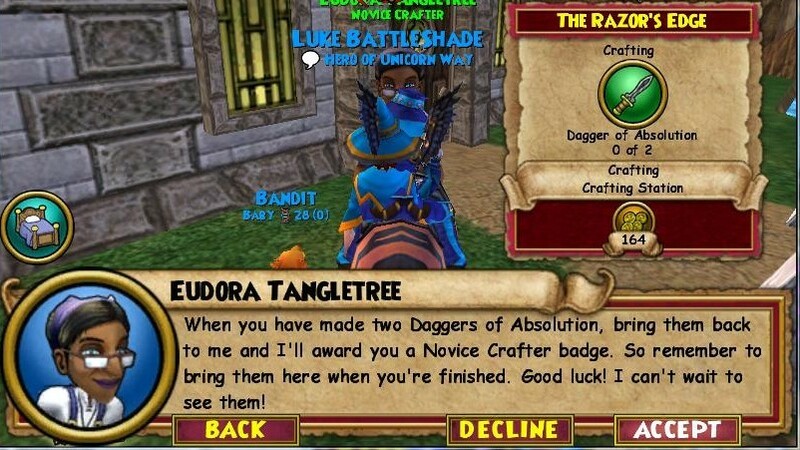 How do I Craft my "Dagger of Absolution"? 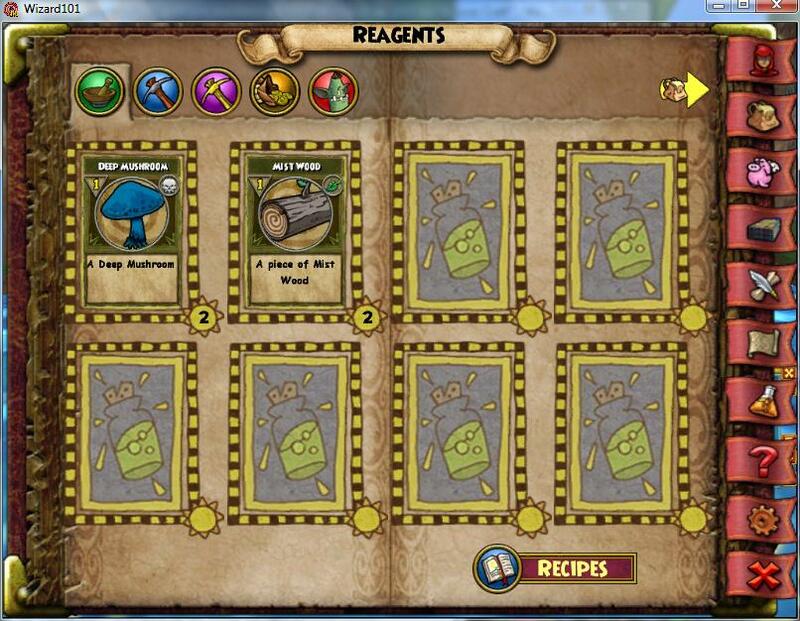 Okay, after you get your recipe and all reagents all ready, you can craft on your Tables. As you advance, you will get better tables and different kinds. You will eventually get special tables for creating clothes, house items and even jewels lol. But, since you just got your table, you have to set your Basic Crafting Table up. So, go to your dorm or house. 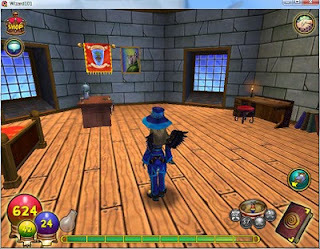 Click on Furniture Icon and find your Crafting Table. Once you do, just place it anywhere. There you go. Then now what? Let's walk to the table. Click "X" to work on the table. 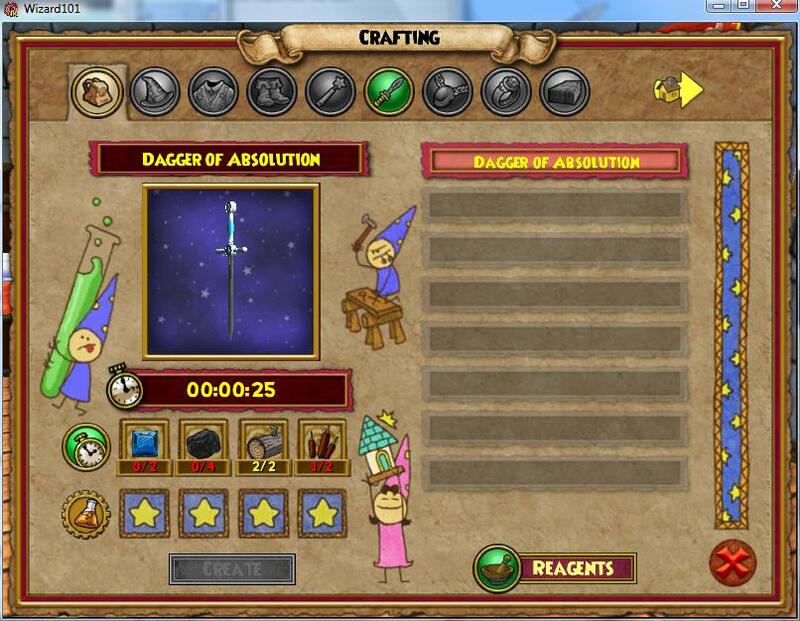 Pick "Dagger of Absolution" then you click on "Create." If you notice a timer; it is a "cool down" timer. 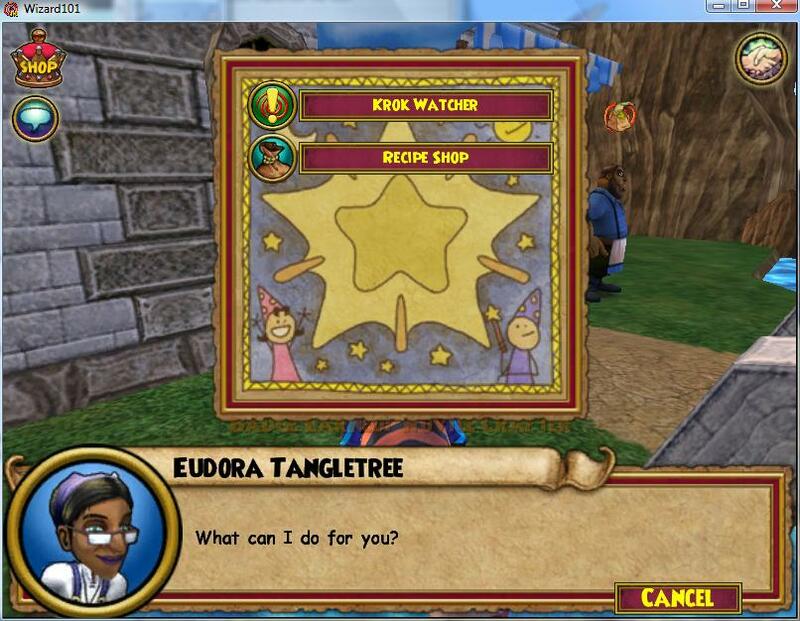 It means you have to wait before a crafting slot is open. The more complex your crafting gets; the longer the cool down. Wait, What's a Crafting Slot? Each table has a slot you can make your creations in. 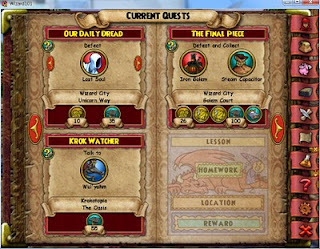 One slot for One Creation. So simply put, the more slots you have, the more things you can make. For the Basic Crafting Table, there's only one Slot and the cool down is really minimal. But, the more advanced your tables get and the more slots you get. And also the more complex your creations gets, the longer the cool downs are. Don't forget you need TWO Daggers, which means you need to create two of them. So once the cool down is done, create once again another dagger. 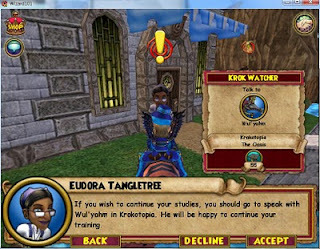 When you are done with crafting both daggers, go back to Eudora Tangletree. Speak with her and turn in your quest. showing what you have accomplished. You can go to your book, click on the very first Tab called Character which looks like a person. Or just press "C". You will see four tabs on top of your Statistics. One looks like a person, One looks like Award Ribbon, One looks like Swords and another a Timer. Click on the Award Ribbon, that is called Badges. Now you can view all Badges you have earned thus far. You can pick any badges you would like to show off. But someday you will have earned ALL badges that is given in the game. It takes time and dedication, but you can do it! Now notice you have a new Crafting quest. 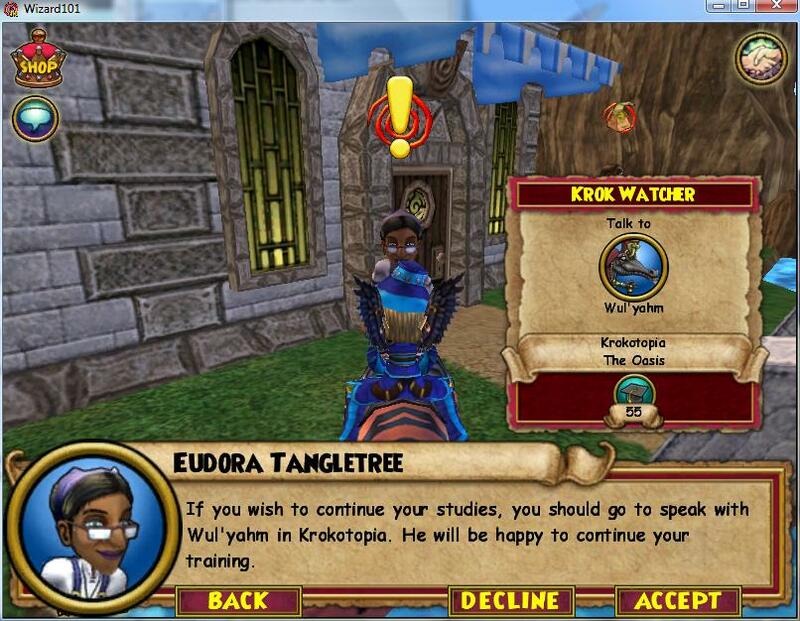 Click on "Krok Watcher." and once you complete it, you will have a new rank higher than your current one. You cannot skip a world to rise up in rank faster. 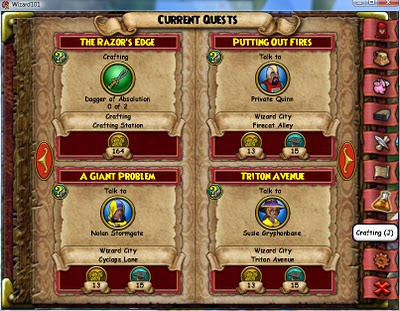 You must do crafting quests in each world except Grizzleheim which doesn't have any. 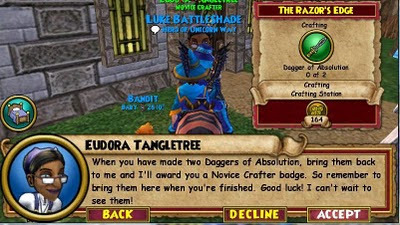 How many Crafting Ranks are there? But, there are six ranks from Novice to Grandmaster. 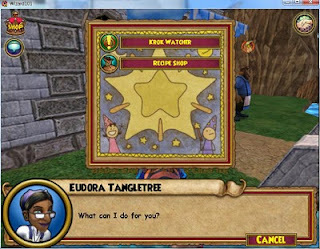 Here's a Diana Wildheart secret: Try to gather double what you need for crafts, so you can make them easy and fast. 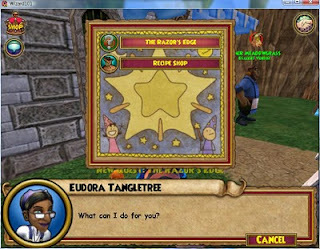 That way you won't lose stuff in bazaar when you sell. 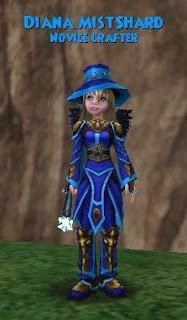 Here's a Kelsey Fireheart secret: Don't craft anything unless you are sure you have ALL reagents for ALL items you need. Then make everything at once. Otherwise, you will have one item sitting in your backpack while waiting for the second one to be made. Then you'll forget what you made and possibly accidently sell them. put it in your BANK while you wait for the other item to be finished. Don't leave it in your backpack which will possibly make you sell it by mistake. Remember once sold, you can't turn them in. Go to our Reagents Section and take a look at our Reagent Dictionary. which allows Members to have faster Cool Down timers. So all crafting cool down is cut down to half for all Members in-game. All Crafting Cool Down information on this site will be in non-member time. But, if you are a member, just cut it down by half.